What does Christmas really mean to you? Is it all about family, food, decorating, singing or buying gifts for family and friends or giving to perfect strangers? Yet, some feel a burden of stress because of the commercialization that we all have experienced over the many years and others the agony of remembering times with a loved one who has passed away. Christmas is an annual festival commemorating the birth of Jesus Christ, observed most commonly on December 25 as a religious and cultural celebration among billions of people around the world. A feast central to the Christian liturgical year, it is preceded by the season of Advent or the Nativity Fast and initiates the season of Christmastide, which historically in the West lasts twelve days and culminates on Twelfth Night; in some traditions, Christmastide includes an Octave. Christmas Day is a public holiday in many of the world’s nations, is celebrated religiously by a majority of Christians, as well as culturally by many non-Christians, and forms an integral part of the holiday season. In several countries, celebrating Christmas Eve has the main focus rather than Christmas Day. The true meaning of Christmas starts with Jesus Christ giving Himself to us. He gives the example of giving of yourself, putting others before you. Christmas became a Federal holiday in 1870 and has been celebrated in various forms over many centuries. Christmas should not be to the point of depression and restlessness. One should participate in the goodwill that has always been associated with this time of year. 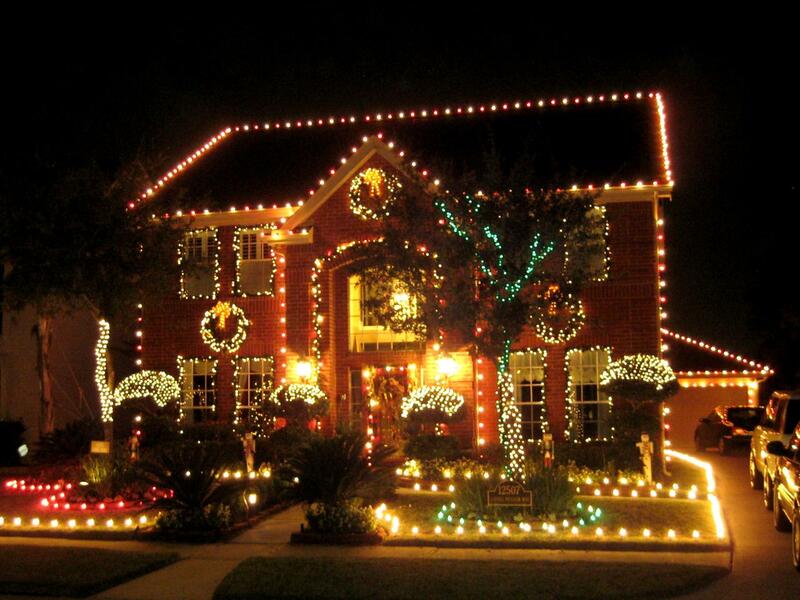 Many feel the need to out decorate a neighbor with their decorations. More lights that are strung both inside and out the merrier one feels. Much like the one in this picture. This, of course, is one prerogative. Unless you are decorating out of the spirit of the season and has caused you less agony in your lives-so be it. It is not intended to be competition Clark Griswold style. Christmas decoration refers to the set of elements that adorn a room, or an environment especially for the celebration of Christmas. Usually the will of who decorates is to make more pleasant and attractive that space. Will you by chance prepare your hearts for glorious things that have not happened yet, as you did prepping your own home with decorations? As many of us do during Christmas time we tend to put up lots of cool, bright and shiny lights and things. Then it is time we turn our attention to the new year and resolutions for the desire of things to come. Thank you Jesus for all the you have given us-the many blessings we have been blessed with throughout this year! Celebrate for the right reasons and with glorious vigor. Merry Christmas to all and to all a good night.